The FIFA World Cup 2010 may be over but the enthusiasm over what's known as 'the beautiful game' continues. Football, aka Soccer, is perhaps the most popular sport in the entire world. Influencing many cultures and lifestyles around the globe. That being said it only makes sense that the fashion industry recognizes how influential the sport and its athletes are to fashion. An announcement made on July 27, 2010 was that Dolce & Gabbana will be designing the formal wear for the players at London's Chelsea Football Club in a 3-year deal. 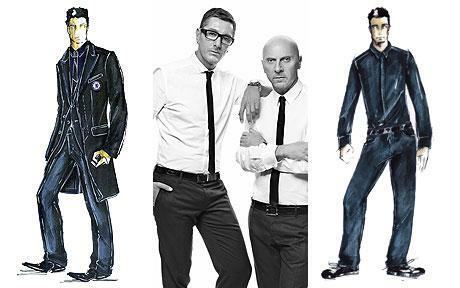 Domenico Dolce and Stefano Gabbana said, "Football players are style icons both on and off the pitch, and, on top of this, there is our love of England and of London, which has always been a source of inspiration for our work." The stylish three piece suits feature Chelsea's lion crest embroidered on the suit pocket with a two-button design in a dark blue twill. It's worn with a blue jacquard tie and blue poplin shirt. There is also a casual look that includes jeans and calfskin sneakers for the players. The collection of items designed for the team also includes a gunmetal tie pin, black leather shoes, a blue calfskin suitcase. 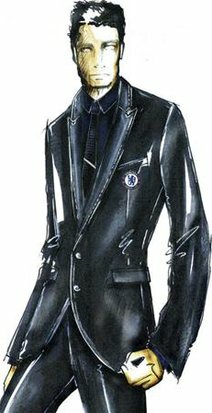 The designers, who are huge football (soccer) fans, have already outfitted AC Milan and the Italian national team. Soccer players are an easy fit in the world of fashion because of their naturally lean physiques and often good looks. Not only will the design-duo outfit the players but they will also be re-designing the interiors of the director's lounge, the main reception and millennium suites corridor at Stamford Bridge stadium, located in West London.